Dolly Parton & Sia Team Up For A New Version Of "Here I Am"
Labrinth, Sia and Diplo's whimsical 'Thunderclouds' video is a must-see. Well, this is a little unexpected! 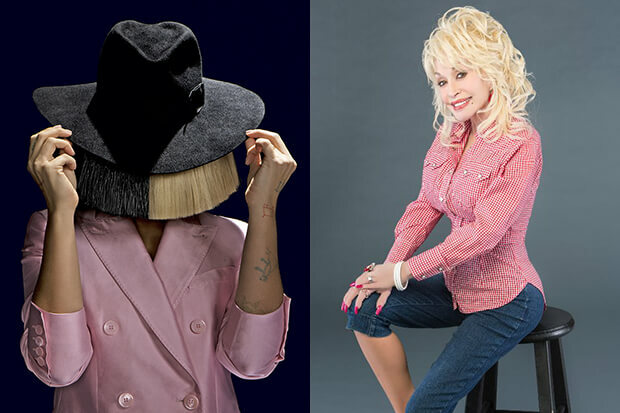 Dolly Parton and Sia are joining forces for a duet, and it arrives tomorrow (September 13). They team up for a new version of the country queen’s enduring anthem, “Here I Am,” which first appeared on her 1971 LP, Coat Of Many Colors. The reason for the union? It’s one of several collaborations on the Dumplin’ soundtrack — a new Netflix movie, which features six new Dolly songs (all co-written by Linda Perry) as well as overhauls of classic hits. Other featured artists include Miranda Lambert, Mavis Staples, Elle King, Alison Krauss, Rhonda Vincent, Danielle McDonald and Jennifer Aniston. (Yes, of Friends fame). The movie tells the story of a plus-sized teenager who signs up for a beauty pageant. Let’s just hope Dumplin’ gets a better critical reception than other recent (not quite) body-positive projects like Insatiable and Sierra Burgess Is A Loser. The soundtrack is expected to arrive on November 30. Listen to the original version of “Here I Am” below.